Many people worldwide are on NSAIDs therapy for a long time to treat chronic musculoskeletal symptoms. But unfortunately, these NSAIDs are associated with potential side-effects which include renal impairment, gastrointestinal complications and cardiotoxicity. Especially patients with cardiovascular disease also have musculoskeletal disease, which adds to the agony of the patients. But now a days, we can overcome these potential and common side –effects with a Safe, natural and clinically proved (Acting same as diclofenac without any side-effects) fixed dose combination of Bromelain, Trypsin (Proteases) and Rutoside (Bioflavonoid) which is proved very potent and safe in relieving oedema, inflammation and promoting wound healing. This tablets contain a combination of these two proteolytic enzymes Typsin and Bromelain together with plant flavonoid Rutoside. This combination is considered as a promising treatment for acute (e.g. sports) injuries, post-surgery, and degenerative joint conditions. Trypsin is produced in the pancreas in the form of the inactive zymogen trypsinogen. When the pancreas is stimulated by cholecystokinin, it is then secreted into the duodenum via the pancreatic duct. Once in the duodenum, the enzyme enteropeptidase activates it into trypsin by proteolytic cleavage. Trypsin in the duodenum catalyses the hydrolysis of peptide bonds so that proteins can be broken down into smaller peptides. Bromelain is a crude extract from the pineapple that contains, among other components, various closely related proteinases, demonstrating, in vitro and in vivo, anti-edematous, anti-inflammatory, anti-thrombotic and fibrinolytic activities. Bromelain is used as an anti-inflammatory and analgesic agent in treating the symptoms of arthritis. The analgesic and anti-inflammatory effects are reportedly due to inhibition of the arachidonic acid pathway of inflammation by selectively decreasing thromboxane generation, changing the ratio of thromboxane/prostacyclin (in favor of prostacyclin), and inhibiting PGE2 in addition to the direct effects on the nociceptors. Other reported anti-inflammatory mechanisms of action of bromelain include inhibition of bradykinin at the site of inflammation via depletion of the plasma kallikrein system, and limiting the formation of fibrin by reduction of clotting cascade intermediates. Rutoside is a natural flavone derivative. It has anti-inflammatory, anti-allergy and immunomodulating activity. Rutoside inhibits platelet aggregation, as well as decreasing capillary permeability, making the blood thinner and improving circulation. Rutin also strengthens the capillaries. It helps to prevent venous edema of the legs. 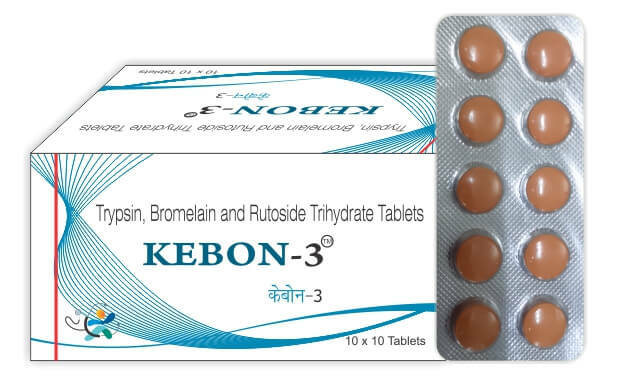 Thus, rutoside is useful in the management of venous edema and capillary fragility. Rutoside is powerful anti-oxidants and effectively combat the harmful free radicals such as nitric oxide, released during the inflammatory process. Rutoside also suppresses the major inflammatory and proarthritic mediators of macrophages. The ability of Rutoside to decrease MCP-1 levels in vivo and in vitro may add to its beneficial effects because this cytokine is a potent stimulator of monocyte recruitment into the site of inflammation. Rutoside also inhibits the phosphorylation and activation of Jun N-terminal kinase/stress-activated protein kinase, leading to the suppression of AP-1 activation. They also decrease the activation of NF-κB in both human and experimental models. Combination of Trypsin, Rutoside and Bromelain has shown to have significant anti-inflammatory effects in several clinical studies. In a clinical study conducted in 2004, the efficacy of an enzyme-flavonoid mixture was compared with diclofenac, a prescription NSAID.The proteolytic enzymes used were bromelain and trypsin. These three agents were used in the form of an enteric-coated tablet (to prevent the enzymes from being destroyed by stomach acid) that contained 90 mg of bromelain, 48 mg of trypsin, and 100 mg of rutoside. For the 6-week trial, the researchers recruited 103 middle-aged patients who had painful osteoarthritis of the knee with a disease flare in one knee joint. The results showed that diclofenac and the bromelain/trypsin/rutoside mixture were about equally effective in relieving the patients' pain and improving their mobility, with no serious adverse events in either case. In another clinical study conducted in 2006, the Phlogenzym- (PE-fixed dose combination of trypsin, bromelain and rutoside) was compared to the nonsteroidal anti-inflammatory drug (NSAID) diclofenac in patients with osteoarthritis of the hip. After six weeks of observation this trial showed significant non-inferiority from 6 weeks treatment with PE in patients with osteoarthritis of the hip and with regard to drug tolerability some tendencies in favour of PE. Thus, PE may well be recommended for the treatment of patients with osteoarthritis of the hip with signs of inflammation as indicated by a high pain level. Bromelain, Rutoside and Trypsin are known to have a very promising role in relieving inflammation and promote wound healing and based on the clinical studies performed on their combination, the Bromelain, Rutoside and Trypsin combination might be a safer alternative in comparison to other drugs used for these conditions. Oral administration of enteric coated tablets containing proteolytic enzymes of plant and animal origin may stabilize or probably enhance a variety of physiological and immunological processes even in healthy consumers. Trypsin is a proteolytic enzyme, found in the digestive system. It hydrolyses proteins. Trypsin is commonly used to digest proteins into peptides. Trypsin removes dead and necrotic tissue. Thus it improves humoral response and prevents growth of pathogens. Trypsin can also be used to dissolve blood clots and treat inflammation. Enzyme preparations containing Trypsin, inhibits the rise in C-reactive protein which indicate that the increase in serum acute-phase proteins is prevented in Trypsin treated groups. Bromelain a proteolytic enzyme, breaks peptide bonds inside protein molecules. It is an anti-inflammatory agent, and so can be used for sports injury, trauma, arthritis, and other kinds of swelling. Bromelain's anti-inflammatory activity appears to be due to a variety of physiological actions. Bromelain is capable of selectively modulating the biosynthesis of thromboxanes and prostacyclins. It is hypothesized that Bromelain therapy leads to a relative increase of the endogenous prostaglandins, PG12 and PGE2 over thromboxane A2. Bromelain has been shown to decrease aggregation of blood platelets. It is an effective fibrinolytic agent in vitro and in vivo. Rutoside is the glycoside, formed by combining a disaccharide and flavonol, it has antioxidant activity, as well as anti- inflammatory, antihistaminic and antiviral properties. Rutoside increases the strength of the walls of the blood capillaries and regulates their permeability so as to normalize pathologically increased vessel permeability. Rutoside may also help sustain levels of the biological antioxidant reduced glutathione. No clinical trials have been conducted to evaluate the drug interaction of Trypsin, Bromelain & Rutoside Tablet . However, no evidence of incompatibility of this Combination with other simultaneously administered drugs has been reported. This tablet must not be used in case of known hypersensitivity to its active ingredients. The preparation must not be used by patients with severe inborn or gained coagulation disorders. (E.g- hemophilia, severe liver damage, dialyzed patients). Administration of Combination tablet during pregnancy and breastfeeding is not recommended.